One does not commonly encounter reports on the environment front, particularly in respect of citizens efforts at conservation, that warms the heart. It is, therefore, important to focus on one when it appears. To this category belongs Hiren Kumar Bose’s account in the environment conservation website VillageSquare.in, of how residents of Poi village near Kalyan in Maharashtra adopted a degraded local deciduous forest and turned it into a haven of biodiversity. The ground for the conservation work under the Joint Forest Management Scheme based on the National Forest Policy of 1988, was prepared when the State Government launched an initiative in 1992 to bring forest officials and villagers together to conserve forests. Harischandra Daji Sambre, a forest guard who has since retired, started, in 1998, a process of interaction between officials of the Kalyan-Murud range and the over-800 strong villagers. Following the meetings, villagers adopted the forest and established the Poi Forest Management and Forest Protection Co-op Society Limited. The efforts of the residents of Poi stand out as particularly commendable given the context. The VilllageSquare.in account cites a 2016 report of the Comptroller and Auditor General, which states that Maharashtra, which launched its own forest policy in 2008, with the objective of bringing 33 per cent of the State’s land area under forest cover, has spent Rs 6,810 crore on the project without any increase in the area under forests! While lauding the efforts of the villagers, one must lament the marked infrequency of such initiatives. Simultaneously, one must condemn the Maharashtra government’s utterly lacklustre performance in the area of afforestation. It, however, is not the only State Government with a dismal record. Also, the performance of the Ministry of Environment Forests and Climate Change has been mixed. The total area in the country under tree and forest cover comes to 802,088 square kilometres or 24.39 per cent of its geographical area, says the India: State of Forest Report 2017. This, according to the report, marks an increase of 8,021 square km, or one per cent, over the area in 2015. Comparing this with the fact that the total area under forests was estimated at 500,000 square kilometres or 17 per cent of the land area, inthe early 1990s, one gets and idea of the progress made. More, since 1991, India has reversed its trend towards deforestation. Prima facie, all this is most commendable given the pressures generated by growing human and livestock populations. There are, however, aspects that warrant serious concern. Some figures are suspect. A report based on the findings of the National Remote Sensing Centre, Hyderabad, made the shocking revelation that against claims of afforestation covering 19.64 million hectares during 2003-14, the actual area was 2.4 million hectares. Where did the Rs 41,000 crore spent on the project go? One needs to investigate this, as one must investigate the dismal survival rate of forest plantations and the allegation that neither are plantations monitored adequately nor are complete records kept. Hence, years later, one cannot always identify the locations where plantations had been undertaken earlier. As a result, re-plantations in old areas, it is alleged, are passed off as new plantings. This allegation needs also to be investigated thoroughly along with the links that many forest officials have with the timber, builder and poaching mafia. The matter is serious. Climate change threatens the lives of millions of people living in the country’s coastal and vast deltaic areas. A significant progress in afforestation would contribute to halting the process by reducing the impact of carbon emission through the absorption of carbon dioxide from the atmosphere by trees. This would be in addition to other benefits of forests like the prevention of soil erosion in the catchment areas of rivers and precipitation of rainfall. Not just the Government, people need to chip in. Residents of Poi have shown the way. There are times when you realise that the world is genuine in "Kal Yug" when people can make a road on a live dog. How apathetic and horrible you must be to do something this awful? Its time like these I feel ashamed to be a human and an Indian. Residents allege the dog was alive. According to them, the animal was howling in pain but the construction workers ignored it and continued laying the road. Passersby were shocked to see the dog's body burried under the newly-built road. AGRA: Hot coal tar was poured over the body of a dog while Agra's Fatehabad road was being constructed on Tuesday night. Residents allege the dog was alive. According to them, the animal was howling in pain but the construction workers ignored it and continued laying the road. One report suggested that the workers couldn't see the dog as they were working at night and it was dark. "A fresh layer of coal tar was being laid on the road from Phool Sayyed crossing towards the Circuit House and the Taj Mahal. A dog was sleeping on one side of the road. Instead of chasing the animal or removing it physically, burning coal tar was poured over it. Later, a road roller crushed the animal. The body has now disappeared," social activist Naresh Paras told PTI. 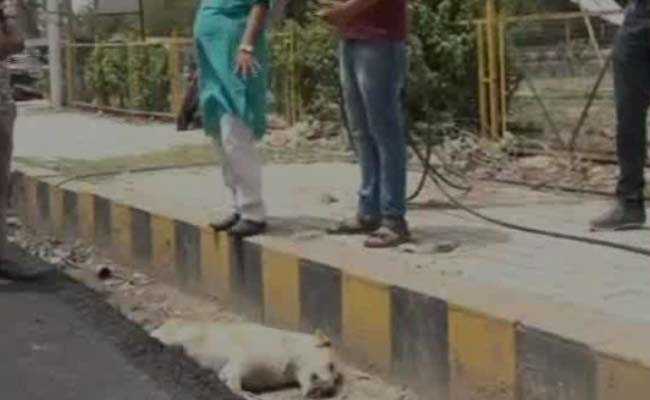 Govind Parashar, a right-wing activist in Agra, claimed that he saw the dog's legs buried under the newly-built road and it was squirming in pain. Moments later, he alleged, the dog died. The dog was dug out for burying. "I felt really bad and I wanted to bury the dog, so we got the dog's body dug out," he said. 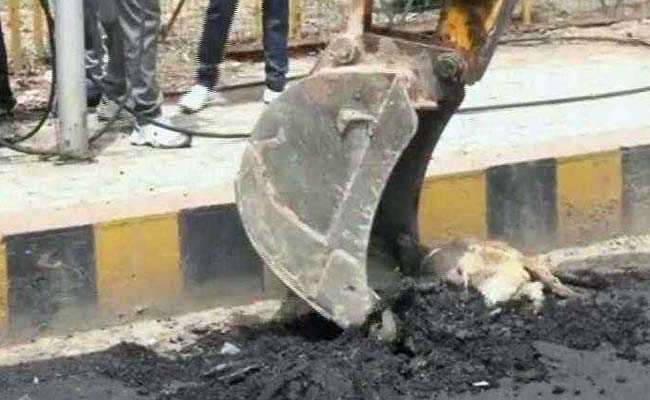 "I also wanted that road construction workers get a lesson so that they don't do this again, so I filed a complaint against the construction company," Mr Parashar told ANI. Activists from various organisations gathered at the spot and seized the vehicles of the construction crew. They also demonstrated outside the Sadar police station in Agra to demand action against the "dog killers." A Public Works Department engineer, Naresh Kumar, said the construction company, RP Infraventure Private Limited, would be sent notice as a warning. Following the report, social activists and dog lovers vented their anger on social media. The photographs of the half-buried dog were shared on social media early today. Angry comments from social activists and dog lovers prompted Agra's Sadar police department to register an FIR against unknown persons. Anand Rai, a social activist, said, "Height of cruelty." Saloni Rana commented "what else these insensitive people can do. Should be criticised and punished... where's the world going!!" Senior journalist Sunayan Chaturvedi said "(it was) an act that shames humanity." The project's contractor in-charge said an inquiry was underway and "those found guilty would be shunted out as punishment." Photograph by Mala Mukerjee, one of India's leading photographers. I was sent this photograph by a friend and realised it was taken by a well-known photographer. When I look at this photograph, I feel Joy while majority Indians see things to be removed. I don't understand why humans do not understand the concept of inclusiveness.